When people come down with minor illnesses such as flu, cold, urinary tract infection, or intestinal problems, they usually lose their appetites and have very low energy levels. Most would want to stay in bed, take some over-the-counter medication, sleep, and let the medication and their immune systems do their jobs to kick the illness to the curb. However, for individuals with diabetes, a common sickness or infection is not as easy to fight off. Without careful care management, the fluctuation of glucose and ketone levels can trigger severe complications. If left unattended, these complications can become life-threatening medical emergency cases such as diabetic coma. To avoid such daunting situations, the best way to cope with a minor illness is to learn, plan, and prepare ahead of time. What Happens to Your Body and Your Blood Glucose When You Are Sick? What Should Be in Your Logbook? What to Do If You Keep Food or Liquid Down? When to Return to Normal Meal Plan? When Are You Too Sick For Work? What to Expect When You Child Is Sick? Depending on general health, age, and hormonal differences, each person reacts slightly different to illness. But generally, when you are sick, you are under stress. To counteract, your body releases stress hormones such as adrenaline and cortisone into the bloodstream to activate glucose production in the liver. This reaction leads to a rise of blood glucose levels above normal level and desensitization of the blood glucose-lowering effects of insulin. Under these circumstances, even the most stable diabetes becomes much harder to control within the target range. Also, vomiting and diarrhea can reduce nutrient absorption and affect your blood glucose levels. For type 1 diabetes individuals, if your body does not have enough carbohydrates, it will start burning fat for energy and produces ketones in the process. As a result, your ketones levels will escalate. If the condition persists, the above-normal levels of ketones may lead to ketoacidosis or even diabetic coma. For people with type 2 diabetes, especially seniors, you can develop a similar condition called hyperosmolar hyperglycemic nonketotic coma. Both of these conditions are extremely dangerous and can be fatal. The good news is that you can learn to manage your blood glucose and ketones levels at home by following appropriate advice and protocols. By knowing exactly what to do in these circumstances, you will feel less stressful since you are not facing the complications in the dark. It will also give you an idea of how to manage your illness by yourself and when to call for help. Keep up with your flu shots. Wash your hands properly and often when you come home from public places. Always wash your hands before you eat. Bring wet napkins or hand sanitizer gels in your bag in case there is no place for you to wash your hands. Stay six feet away from a coughing or sick person. Avoid badly ventilated public areas during flu seasons. Bring a surgical mask in case you have no way of avoiding these places. When you sense that your immune system is down, take extra vitamins, eat more fruits, and drink more water for several days. The boost in vitamins and fluids will kick your immune system back to normal. Clean your home often to get rid of germs that may make you sick. If you feel that your throat is acting up, gargle with salt water in the morning and evening after you brush your teeth. The salt will help kill off the germs and decrease the chance of infection. Exercise often and eat healthy foods will give you a general boost the immune system and in your overall health. A plan of medication adjustment when your blood glucose drops too low. A plan of medication adjustment when your blood glucose gets too high. 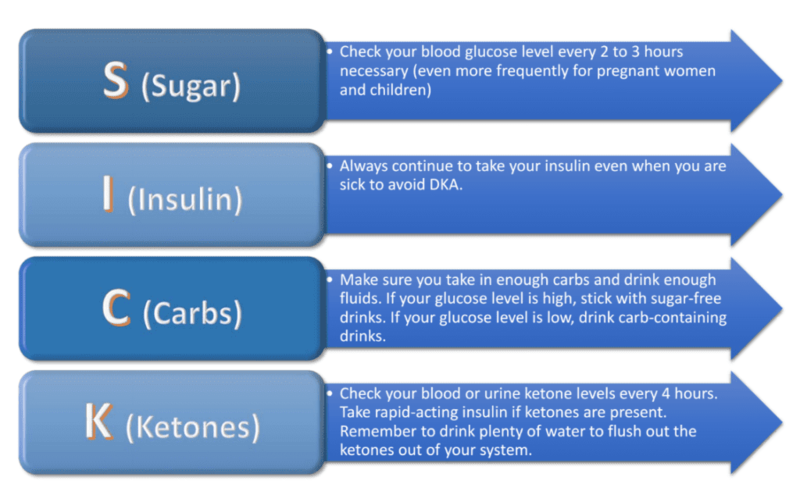 How often you should measure your blood glucose and urine ketones. What medications to take and what medications to stop when you are sick. What food you should eat when you are sick. When you should call your doctor, educator, dietitian, or emergency on-call doctor. And make sure you know how to reach your doctor, educator, and dietitian at night, on weekends and holidays. A log-book or app program to keep all your data as well as all the emergency information, emergency contact numbers, and your insurance information. Whether you have type 1 or type 2 diabetes, the Number 1 rule of thumb is to continue taking your insulin medication. Most people require an increase in medication either by oral blood glucose lowering medications or insulin (please refer to “How to Calculate Your Dosage Adjustment” for more information about dosage readjustment and “Advice for Taking Care of Children with Diabetes” for information for children). Blood glucose and ketone levels should be checked every 2 to 3 hours to readjust your medication plan. Set a timer to remind yourself. Remember to double check if your ketone testing strips have expired as they are only good for 6 months after the bottle has been opened. You should drink plenty of fluids to maintain hydrated. It will help flush the ketones from your system and lower your body temperature. You should try to keep your carbohydrate intake as normal as possible even when you are sick. Your body needs sugar for making energy and balancing your insulin level. Even when your appetite is low, try to eat food that contains carbohydrate such as dry biscuits, toast, and boiled rice. If you have no appetite at all or the illness is preventing you from swallowing properly, you can replace your meals with drinks.If your blood glucose levels are below 15 mmol/l, your drinks should contain glucose; if your blood glucose levels are above 15 mmol/l, they should be unsweetened. There are various reminder apps to help you maintain a regular eating/drinking schedule. Getting plenty of rest is critical. Stop all vigorous exercise routines that will stress out your body even more and be kind to your body. Keep logging all your information in a notebook for several reasons. When you are sick, you cannot remember as well about what you ate and when was the last time you took your medicine. By logging all your information down, you can easily refer to your previous activities and judge whether you are getting better or worse. You will need all these information if you need to consult your doctor or diabetes educator.Should you need emergency care, you will probably be too sick to answer all the questions properly. By handing over the notebook, your emergency care doctors and nurses can quickly figure out what to do to treat the complications. If there is no way you can remember all the information when you are well, you can be sure that you will not be able to remember anything at all when you are sick. Instead of looking for all the information you need when you are sick, compile a list of information in your logbook binder. The second template is designed for individuals who have type 1 diabetes and require intensive management of their sick day progress. It includes an hour-to-hour monitor of your weight, your blood glucose and ketone levels, your medication dosage and readjustment units, your food intake diary, and your fluid consumption record. This chart is also very useful for infants and younger children as their health conditions can fluctuate much drastically within shorter time interval. I really like your advice to plan ahead. My cousin has diabetes, and there have been some scary things that have happened before. The last thing we want to happen is for her to have to be rushed to the hospital or something like that. She is always stocked up on the foods and other things that she needs to stay healthy. Do you have any other tips when it comes to health when you have diabetes?